Comics Experience Blog: Eagle Awards! We need your help! Back from vacation and what great news! 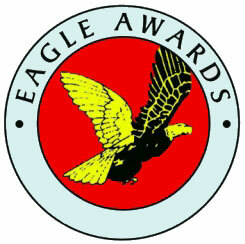 My book (and I guess that means me, too) is nominated for a prestigious Eagle Award! It's nominated in the "Favourite Comics-Related Book: category. I can't explain how cool this is. The Eagles are the British Eisners--this is a truly exciting thing for me and I hope reflects how the book has been received by its audience. But why stop at nominations! If you can spare the time (PLEASE SPARE THE TIME! ), just jump on over to the website and cast your vote for "The Insider's Guide to Creating Comics and Graphic novels" by, well, me. Here's the link to vote. Just need your name and email address (the don't spam you) and then cast your vote. Takes about 45 seconds. The book itself I wrote when I was just planning to leave Marvel editorial and go out on my own to start Comics Experience. It was about a year after I left that I finally finished the book. All told, it took about a year and a half to complete. The Guide is a good tour through the steps it takes to make a professional comic book. It's got a lot of tips from lots of professional contributors like Neal Adams, Gene Ha, David Finch, Klaus Janson, John Romita Jr, and and many more. It's not all interviews though, it is a step-by-step guide. And it was a heck of a lot of fun to write and put together. Marvel was really cool about letting me use a LOT of art from the Marvel Comics I edited and John Romita Jr. was so awesome to give me unlimited access to his art from his original graphic novel "The Gray Area: All of This Can Be Yours." It's written for beginners and has been really well received. If you can, please vote today! And thank you in advance to everyone who votes and everyone who has already enjoyed the book! 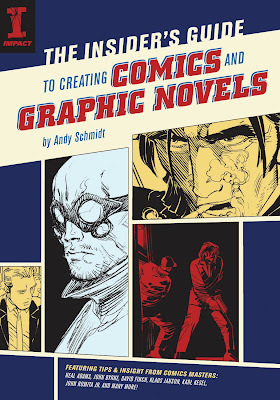 And if you'd like to order the "The Insider's Guide to Creating Comics and Graphic Novels" just click on the image of the book and you'll go straight to Amazon!